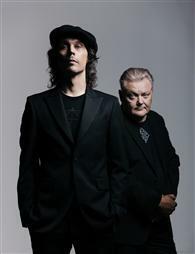 The long-awaited album with Rauli Badding Somerjoki songs, interpreted by Ville Valo & Agents, will be released 15.2.2019. In March, the band goes on tour and also comes to Viking Grace. The repertoire consists of never-heard interpretations of Badding's classics like Tähdet tähdet, Paratiisi and Ikkunaprinsessa and of course the new single Orpolapsi kiurun.